Whether you’re a recruitment consultant or in internal HR, then a big part of your job is to attract the right candidates. And to attract good candidates, you need an effective job description. With this in mind, we sifted through a small mountain of jobs that were advertised on our sister site Vacancy Central during January 2017, to see what works and what doesn’t. What we found was nothing short of astounding. What is the ideal length of a job description? As you can see, there are two particularly interesting things that can be drawn from the chart above. These are the spike in the average number of applications generated by a job advert when it is 500-749 characters in length, and the general improvement in the number of applications running from between about 2,500 and 3,999 characters. Given the large number of job ads (388,281) that make up our sample, the fact that job ads of a certain length received a very high application rate, while those of other lengths were much less popular, is interesting. This suggests that recruiters could benefit greatly from ensuring that the job descriptions they write are in the region of 500-749 characters in length. Considering the data points on either side of the spike – each of which is higher than those in the surrounding area, it is clear that our research has identified a sweet spot in job advertisement length. 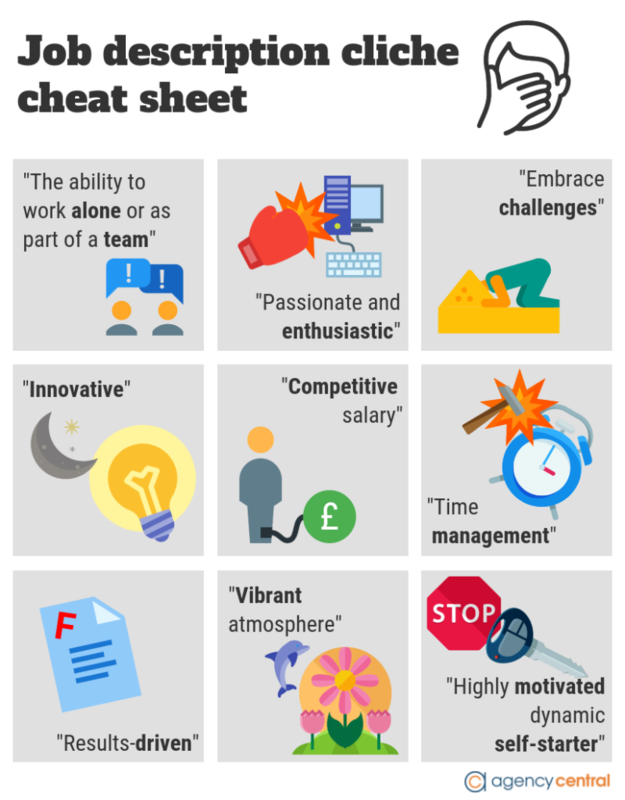 But when we’re writing job descriptions, we don’t usually think in terms of characters – so how many words should we be aiming for? Well the answer varies depending on how often you use long words, but on average, 500 characters (including spaces) will be somewhere in the region of 90 words for most people. So, according to the results we have here, the job descriptions which received the most replies were probably between about 90 and 135 words long. Why do shorter job descriptions receive a higher response rate? 135 words is not a very long job description. 90 words is even shorter. So why did job advertisements between these lengths fare so well in our study? Landing yourself a bigger salary. Getting a job in a certain geographic location. Improving your work / life balance. Joining either a larger or smaller organisation than the one you currently work at. Joining a particular organisation or working on a particular type of project. Getting a particular job title (often either a promotion or a change in career direction). Getting a job, full-stop (if you’re currently unemployed). Your chances of achieving any of the above. With this being the case, a relevant job description really doesn’t need to be that long in order to tick all of the boxes its reader probably cares about. When you consider that an active jobseeker will probably spend a lot of time reading (or rather, scanning) job descriptions, you can see why a shorter, snappier ad is a good idea in many cases. But there’s an optimum here. Too short, and you’re probably not telling the reader what they need to know in order to get them to apply – hence why job descriptions of 0-249 characters in length received such a low response rate. Too long, and the reader gets put off – hence the big drop in response after about 4,249 characters. The bulge in the number of applications from 2,500 to 3,999 characters is interesting, but there is likely to be a simple explanation for this. Generally, more technical fields such as engineering or software development will have longer job ads, given their very nature. It seems likely that this bulge is just this in action. Firstly, we need to have a word about cliches. They need to go. Seriously – they’re damaging your response rate. If you don’t understand why these cliches are so awful, then take a look back at the points in the section above that jobseekers and candidates actually care about. These cliches don’t address any of these important points – and one in particular (the salary one) is likely to be seen as a thinly-veiled attempt to obfuscate the truth. Essentially, whenever you type one of these things, you’re bloviating – they are a meaningless waste of words. So what should you actually write? We spoke to well-known recruiter Mitch Sullivan to get his opinion on what makes a good job ad – and this conversation further underlined the importance of considering your target audience when writing a job ad. Mitch was keen to point out that your target audience in this case is not the company doing the hiring – but that way too many job ads are written from this perspective. Instead, consider the candidate when putting your ad together – and ensure that your copy speaks to their needs and concerns. This will mean that your ad will attract candidates who want a better job – as opposed to simply candidates who need another job. What all of this means from a recruiter’s perspective is that the initial briefing with the employer is crucial. You need to ensure you ask the right questions in order to allow you to write an effective job ad. Now, there are more complex variants of AIDA, but utilisation of another principle – the KISS Principle (keep it simple, stupid) – tells us that the most basic form is probably the most useful. This is a pretty obvious one. If the people you want to read your job ad don’t actually read it, then the whole rest of the house of cards comes crashing down – there’s just no point bothering. We need to ensure that our ad jumps out and grabs the people we want it to. Take a look through the average job board and you’re going to see a lot of cliched openings. If you’re a busy person scanning through the listings, these are going to do nothing to make you click through. What we need to do is disrupt the pattern as our target’s finger works that scroll wheel. So instead of speaking at them, try speaking to them. Say something different. Use the fact that you spend all day talking to candidates in your field to imagine what you think will grab their attention. Maybe it’s a ‘hey you’, or perhaps they’d prefer it if you led in with a single sentence story? Once you’ve grabbed someone and made a reader out of them, it’s time to pique their interest. This is where you begin the task of selling the job, for real. Think about what it is that your prospects want and then look at what the job you’re writing about could realistically give them. Is it the fact that they’d get an extra five days of annual leave every year, or perhaps two thirds of the firm’s directors started out on the shop floor? Because you know what’s likely to interest the potential candidates you’re looking for, you know how to do this. It’ll be a big carrot on a stick to make them read on. Or perhaps you can think of a better approach – in which case great – so go for it. The desire stage of the model comes right before we flip our prospect into a candidate. Here we’re going to make them want to apply for our job. Use your thinking gland and consider what’s going to make that happen. Are they currently trapped in an inferior role, struggling to make it on their distinctly average salary? Perhaps they want to give something back by working for a non-profit? Don’t be afraid to use the negative and show them what their life will be like if they don’t apply for this job. More of the same. More unfulfilling work, low pay, and non-existent perks. This is where the magic happens – it’s where you convert your reader into a candidate. Everything you’ve written up until this point was just to set yourself up for this. Make or break. If you’ve written much sales copy in the past, you’ll know that you should always. Always. Always Have a call to action. And job ads are no different. It pays to create a sense of urgency at this point. We could of course put a closing date for the application – which might work if it’s the day after you place the ad. But more likely a prospect will see it, realise that it’s not for another two weeks, and put the tedious job of writing an application straight to the bottom of their to-do list. What we need to do is make them wish they could apply yesterday. Perhaps you’re ‘looking to fill the position asap’, or ‘eager to speak to you today’. Again, the trick is in creating something unique, so your reader doesn’t feel like they’re being sold to. Stating that the ad will be withdrawn after a certain number of applications have been received is another tactic that can work well here. This works even better if the job board in question doesn’t state how many applications have been received. So, here we have, in a very basic format, the steps you need to take to start writing better job advertisements. We’ve shown you how important word count is in writing a good job ad – and our research shows that you’ll want to limit yourself to about 90-135 words, unless perhaps the job you’re writing is very technical. In these cases, the optimum may be closer to 600 words. You should strive to avoid cliches in your work (and more on this in a second), because not only are they a waste of words – they’re also making the jobs you advertise sound generic and rubbish. Consider the people you want to read your ad. Get an idea in your head of who you are targeting. Give them a name if you want. Create your job ad with this person in mind. Write it with this person’s perspective in mind (rather than that of the hiring company) and you’ll attract a greater share of the best candidates. Finally, when creating your job ad, use the AIDA technique to gain the attention, interest, desire, and finally action of the people you’re looking for. Social selling versus cold calling in recruitment – which is the better method?